Slow Death by Rubber Duck. Rick Smith and Bruce Lourie. Canada: Vintage Canada, 2009. 339 pp. Rick Smith and Bruce Lourie compile a most comprehensive collection of the toxic substances that surround, affect and damage our daily lives in Slow Death by Rubber Duck, in trying to inform the everyday individual on how to reduce our chemical exposure as well as that of unprotected infants. Rick Smith is the Executive Director of Environmental Defense, a leading environmentalist in Canada holding a doctorate in biology from the University of Guelph; Bruce Lourie is an environmental thinker who began one of the largest consultancies in Canada, working tirelessly with a wide range of businesses, governments, foundation and non-profit organization from the local to federal level. In writing Slow Death By Rubber Duck, Smith and Lourie’s motivations are concerned with informing the general public the dangers of long-term effects by exposure to everyday items made and containing highly toxic chemicals; protecting ourselves from further exposure by providing simple consumer methods and choices in better selecting products and in trying to reduce the chemicals in our bodies over the long term, especially in children who’re most vulnerable. Based on information provided by the book’s author, Slow Death by Rubber Duck provides a mixed bag of information, analysis and reaction. The method of informing is insightful; the testing is a bit absurd but represents the minutia of everyday toxicity; results are too simple and are disproportionate to testing sample and percentages for the general public. The method to detox is enlightening and simplistic for the everyday person and challenging the status quo is made to be simpler than intended. Nevertheless, the book itself riles you up in wanting and needing you to take action. Although Rick Smith and Bruce Lourie’s simplistic manner of informing everyday readers, the conscientious methods of informing the public and subsequently providing methods to reduce exposure to toxic chemicals are attainable and make a hopeful future chemical-free. Certainly the method to inform readers would be an arduous task and thankfully the book’s authors didn’t make it so. Every chapter deals with a different toxin (from plastics to mercury and to bisphenol A) and turns around back to a method of detox from all these chemicals. All of this information is provided in terms and concepts easily digested by those lacking a doctoral degree and so the layman’s terms may come across as insulting one’s intelligence. In the first chapter “Pollution Then and Now”, the authors point out simple and effect ways at assessing the vast reaches of thousands of toxins in today’s world: “1. It’s now global rather than local 2. It’s moved from being highly visible to being invisible 3. In many cases its effects are now chronic and long-term rather than acute and immediate” (Smith and Lourie 14). If that isn’t terrifying, and yet insightful, how else can an environmentalist and an activist rile up the everyday person to stand up to their government (from local to federal) to fight for causes that will benefit them and their families in the long-term? Certainly, this thinking of saving long-term costs on health-care and other various medical facilities and their associations would be a primary reason in Canada, especially since out Medicare is entirely supported by the government and the taxpayers money, to combat the perils of toxins. When it came to proving the possibilities of these specified toxins, the duo decided to test themselves in certain controlled situations the exposure, ingestion or subject themselves to the chemicals. Deciding to host themselves in an apartment and expose themselves to these chemicals in a method that mimicked “real-life situation” and so, they got their blood and urine tested at two specific points during the experiment: before and after exposure. They tried to reduce their exposure from these chemicals before the experiment (about 24-48 hours), thus reducing the chemical in their bodies. Therein lays their first mistake: reducing natural exposure to levels would be premeditative in what would be an out-of-the-normal efforts compared to a “real-life situation” experiment. Smith and Lourie would reduce their exposure to of Bisphenol A from heating plastic containers; fish that have high levels of mercury; phthalates in plastic toys; PFCs and PFOA (from non-stick cookware. ); PCBs (flame-retardant clothing and furniture); triclosan from antibacterial labeled products and pesticides. 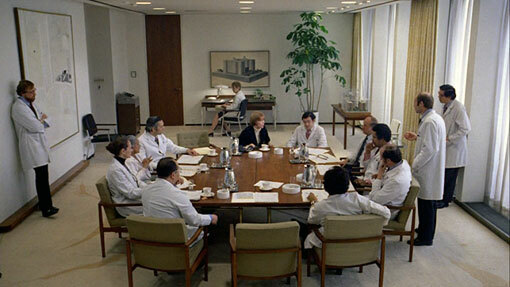 They not only unnaturally reduce their exposure to said chemicals, but they over exaggerated and overexposed their exposure during testing by spraying PCBs on all surface in the apartment, to which they nearly suffocated themselves; constantly cooking or heating food in plastic containers or in Teflon non-stick pans (Bisphenol A and PFCs, respectively); eating ridiculous amounts of meals with canned tuna, those specifically higher in mercury; and cleaning themselves with products marked antibacterial (Triclosan) and those with “Fragrance” (phthalates). If these methods, reducing these toxins or manipulating exposure to them, were part of their supposed “real-life situation” experimentation, they failed miserably. Such failure leads to misleading results caused by said experimentations with toxins. As mentioned above, the manipulation of reducing the particular level of toxins in their bodies (the authors subjugating themselves as lab rats), and them overexposing themselves to said toxins in an enclosed space does have an effect of testing, but results as well. If the methods are faulty or irregular, so will the results and those were reflected especially in the mercury testing. Eating several meals, and in larger quantities, had results that weren’t accumulative but compounded when the mercury levels had nearly tripled after 7 meals/snacks, it “showed that the mercury concentration in my blood was 3.53 µg/L (micrograms per liter). The North American average was less than 1 µg/L, so [he] had about four times the average mercury levels in [his] blood before [his] tuna eating even began” (Smith and Lourie 138). This grabbed my attention and made a faulty representation once the final results came in. Bruce Lourie tried to equate this result to most people, even after they stated that the national average was nearly 4 times less than initials results. If there’s an average stating the mercury levels in those living in North America, what is the point in equating the results of Lourie’s experimentation, to which was manipulated beforehand and during testing, as something that people have already been avoiding? The interesting thing that they may have overlooked is the eating habits of fish by North Americans. They could be below (which certainly would attribute to the levels indicated in Rubber Duck) or are they above average as far as eating habits go when it comes to fish. I certainly would believe that they’re below, since our culture is certainly eating more red meat than any other kind of meat available. Therefore, if those eating habits reach the standard meal guide as recommended by Canada’s Food Guide, what would the mercury levels be then? How would they compare to the results that have been attained? One thing is for certain, that issue was not tackled, nor even mentioned, in the Smith and Lourie’s documentation from their experiment or their analysis. One of the issues surrounding this experimentation was: “What effects would these have on the authors as their own guinea pigs?” Certainly the end result would be detoxification. The method to reducing exposure to said chemicals are fairly simple, if not excruciatingly confusing to execute. Many of these toxins are labeled under trademark names that give them an innocent gloss. For example: Triclosan and Phthalates are on product labels with the prettied label of “Antibacterial” and “Fragrance/Parfum”, a deception to say the least. Firstly, it has been stated in the book that most antibacterial products are part of a trend or obsession with germ-phobia and the need to sanitize everything. There’s only one problem: “1. Mounting evidence that, in many products, it works no better than competing products that have no triclosan 2. Increasing levels in people and the environment that have now been linked to health problems—and the biggie: 3. Good reason to think that it’s contributing to bacterial resistance, aka the rise of “superbugs”” (Smith and Lourie 165). Thankfully, authors Smith and Lourie parsed some specific warnings throughout the entire book, but reassembled the advice given into one single chapter who’s simplicity and condensed nature were easily digestible and permit a much easier flow into anyone’s daily routine. Providing easy “action items”, anyone can follow some simple guidelines and begin their path to living chemical-free. Nothing can be more reassuring than having a federal stance on the removal of a toxic chemical from the products sold in Canada. It is this action of “changing the status quo” that becomes the greatest asset to Slow Death by Rubber Duck, that the motivation and justification to rally together, in grass roots campaigns, to help change regulations and legislation and in convincing government (at any level) to champion what’s better for the public and not for the corporation. After all, they should answer to consumer demand and concern rather than spend millions in advertising to confuse or sell us “death”. Through all of the good and bad about the book, the toxins (information, results and detoxing) are something we can begin to avoid and challenge status quo. Concluding the simplistic manner by which we can all become involved in a larger scale than just in our homes. Smith and Lourie provide simplistic and conscientious methods of reducing exposure to toxic chemicals, because long-term effects of these chemicals have negative impacts on the health of individuals. Despite the described simplicity of taking action against these chemicals from the perspective of an everyday reader, Rick Smith and Bruce Lourie’s informative methods are concepts easily adapted into everyday living. After hundreds of interviews; several television appearances; award ceremony musical performances; releasing three albums in three years, one more popular that the last; several dozens of costume changes and countless variations of appearances, Lady Gaga is everywhere and her exposure reaches around the world. A modern mythical embodiment of identity is the veil that Lady Gaga shrouds herself in and wields with ferocity. With that message and power, Lady Gaga has been able to take hold of any interest she generates for herself, the music industry and anyone who pays attention. With such prominence in society, news and culture, Lady Gaga has her fanatics and detractors, two extremes that justify their beliefs. Many say Lady Gaga is the epitome of self-reflectivity, empowering those that live on the fringe of society: gays, lesbians, transsexuals and all the unaccepted; norms that the minority of society clings to so ferociously. The other says that Lady Gaga shouldn’t be listened too, because her music, persona and gimmick/style become loathsome. Although Lady Gaga’s may be off putting, her underlying message of self-empowerment and acceptance is a positive proclamation for society to embrace. With Lady Gaga being so prominent in the media, some often pigeonhole her into the usual rut of “is she’s doing this for the fame/money?” The response to this is often a resounding ambiguity, where artistry and business blend together and form some unknown entity. Certainly, Lady Gaga most prominently features her own self as an image of acceptance by physical means, personality and even culturally. She propels the use of her identity, as a known figure in the music industry, and further makes her message of self-empowerment and acceptance more readily accessible for her “little monsters” (a codename for her fans), her influence is edifying and unrelenting. The purely edifying aspect of being a public figure like Lady Gaga is about putting artistry first, to create content that you and others can embrace and let become a part of you in some way shape/form. The business aspect of the music industry, to which Lady Gaga is so entrenched, always finds a way to monetize her music and publicity and then goes on to maximize exposure as well as revenue. Recently, Lady Gaga sold over a million copies of her latest album: “Born This Way” and it’s clear that she’s a profitable entity; such is the double-edged sword of being Lady Gaga. Her albums and concert tours sells like hotcakes because of the music and identity she represents and then the industry tries to maximize by pushing new albums, merchandise, concert tours, etc. as much as they can depending on the willingness of the artist. Lady Gaga walks that fine line; balancing the two aspects of her music and in doing so, she exposes her message across many mediums and towards anyone who’s willing to listen. Lady Gaga’s music, as well as the fame/artistry aspect, has both positive and negative attributes that revolve around a modern style that often isn’t mass appealing beyond the younger demographics. Often the music industry concerns itself with electro/techno beats, the pounding repetitive rhythm that seems to never end, with an incessant synth backdrop and a totally unnecessary auto-tune sound. As you can tell, I’m not a fan of this style and my preferences go counter to this particular style of sound. Another aspect to Lady Gaga’s music that seems to turn me off is the need for repetition and including her name in the lyrics of her songs. For example, Lady Gaga often incorporates “gaga” into the lyrics of her songs, as she does with “Judas” and “Bad Romance”; although the word can be defined as crazy, as well as infatuated, this double meaning of her name and lyrics creates a self-absorbed nature that detracts from the message. As is with “Speechless”, the message is one of escaping domestic abuse: “I can’t believe how you slurred at me With your half wired broken jaw You popped my heart, seams On my bubble dreams” and that of self-empowerment in “Judas”: “I couldn’t love a man so purely Even prophets forgave his goofy way I’ve learned love is like a brick, you can Build a house or sink a dead body I’ll bring him down, bring him down, down A king with no crown, king with no crown”. This concerns itself with what is the norm in accepted concepts of being loved and loving oneself is often mired in symbolic biblical references and simplistic, as well as bombastic, lyrics. The proverbial mention of “gaga” in the lyrics of “Bad Romance” are glossed over when, in the music video, Lady Gaga is being displayed for a room full of gawking men, she then wears a spark-shooting bra that sets her (oppressive) male lover on his (conquest) bed ablaze. Surely violent means to escape and become self-empowered, but the fire symbolized a rebirth in which she (and women) can become their true selves. What’s interesting to note is how Lady Gaga’s music, including notoriety and fame, is how she can gather interest to creating music videos. A format that was long thought dead since the millennium, the advent of reality TV on traditional “music channels” had all but lost interest in monetizing that aspect of the music industry. One her latest efforts with “Born This Way”, Lady Gaga utilizes a variety of images that reflect mythical goddess’ of the stars and kaleidoscopic images of vaginal and birthing representation, Lady Gaga is celebrating the self-empowered representation of a woman’s anatomy and feminist ideals of accepting one’s self. These music videos by Lady Gaga often have a warped way of representing self-empowered and acceptance of one’s self as primary concern by the individual and avoiding the need to receive validation by others. Though Lady Gaga’s appeal seems to be linked to her outlandish nature, the gimmick of her persona seems to be a question of accepting your inner self and become the “monster within” (one of her “little monsters”) and becoming an edifying ideal of self-empowerment, especially if you belong to a sector of that society that often lives on the fringe. Many often wonder if she’s doing this for the artistry or the fame and she certainly walks a fine line between the two without wanting to sacrifice the ideal of self to an embodiment of an industry that often creates oppressing feelings of commercialization. Lady Gaga’s style is often shaped around electro-pop sound that’s slathered in the creatively whitewashing auto-tune and lyrics that borders a fine line of infatuation and self-empowering ideals. Gaga’s music videos are often layered imagery and mythical representation of female-oriented representation that portrays a positive message of self-empowerment and acceptance. Despite Lady Gaga’s gimmicky persona, her music provides a very positive proclamation that betters society. Possessions are often refuted by the Catholic Church as a practice abandoned many centuries ago, once psychology surfaced as a viable explanation for the condition of mental illness that has afflicted many people. We can see it today, where psychological ailments are diagnosed and fits of psychosis are linked with misfiring neurons rather than assessed through spiritual or metaphysical inquiries. This is more likely due to the dismissal of faith as tangible and directed towards an acceptance of psychology as scientific proof. Such inquiries are evidenced throughout many mediums, but none have the same audio-visual quality of cinema. The most readily accepted format of entertainment has become the medium of exploration and questioning of such ideas of science and faith. Possession films are often a subgenre that tackles both aspects that surrounds the human condition often leaving us in a state of ambiguity, where neither side is right or wrong. 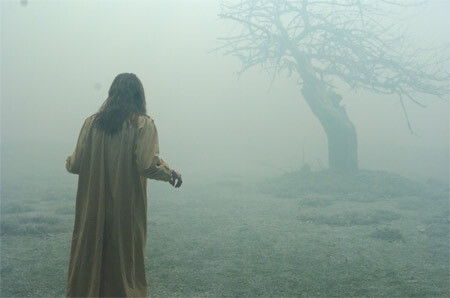 ‘The Exorcist’ and ‘The Exorcism of Emily Rose’ represent a spectrum of change in the “possession film” in which, narrative (spirituality and film style); perception (special effects and violence) and relevancy (box-office and pop-culture), contribute to the differences and similarities of this subgenre and its audiences. When assessing the similarities and differences in both ‘The Exorcist’ and ‘The Exorcism of Emily Rose’, it’s largely perceived in the way that they speak of spirituality. The rejection of religion by Chris MacNeil, a highly successful Hollywood actress and single mother, in ‘The Exorcist’ led to her daughter’s possession by the demon Pazuzu (king of the wind demons) and finally her acceptance that her neglect allowed demons to enter the weakened body of her daughter. Pazuzu also is thought to cause harm to both mother and daughter during childbirth, Chris only having one daughter would be the allusion of the entrance of this demon. In ‘The Exorcism of Emily Rose’ Erin Bruner a successful lawyer, adamant about the existence of God, defends Father Moore after he’s accused of killing Emily Rose during the exorcism of her six demons. The similarity of two successful working women with an objection to God, are surrounded by the apparent horrors they bring amongst themselves.Erin begins pondering the conflict between her oath to the court and the beginnings of her experiences with strange occurrences at 3AM. Often referred to as “the witching hour”, where lore holds that demons mock the Holy Trinity at this specific hour because, Jesus is often thought to have died at 3PM. The films themselves also slightly differ in their film style. ‘The Exorcism of Emily Rose’ plays the “exorcism” as a flashback, informing audiences in a courtroom style narrative of unfolding events. As the murder trial begins to unfold, we’re left to follow a path that Erinbegins to identify: the possibility that demons exist and the need for faith in something is necessary to fight off evil in whatever incarnation they may appear. In ‘The Exorcist’, the film allows the playful nature of participative and passive interaction between viewers and Chris MacNeil (the mother) accepting the growing horrific reality that demons, and therefore faith, are the cause of Regan’s afflictions and aren’t psychological or medical ailments. George Edward Woodberry once said “If you can’t have faith in what is held up to you of faith, you must find things to believe in yourself, for a life without faith in something is too narrow a space to live.” Herein lies the crux that both plagues Chris MacNeil and Erin Bruner, where their perception of faith allowed entrances of demons and that when they accept their presence, they can begin to live without fear. At just over 30 years difference between ‘The Exorcist’ and ‘The Exorcism of Emily Rose’, there’s the growing change in depiction of violence and in special effects. As seen with ‘The Exorcist’, it was often thought as an extreme portrayal of violence especially when concerned with using a child for many of the stunts. The violence was a manifestation towards the disruption of normalcy as well as violent physicality between the demon and the people who would challenge his presence. When we first see the demon Pazuzu manifesting itself, it was concerned with unsettling the people who mattered most when choosing Regan as its host. Those people were Chris MacNeil (Regan’s mother) and Father Karras (who later forced the demon into his own body so that he’d save Regan); by having a possessed Regan physically strike them both making them seem weak and helpless. In ‘The Exorcism of Emily Rose’ similar physicality is demonstrated as Emily Rose begins on path of heightened contortion and body movement. As the possession of Emily Rose’s body progresses, the more the demon utilizes her body as a vessel, contorting the human body into position that aren’t natural with a malleability to his will, and he also creates a stiffness and abuse of the body as he see’s fit. What’s interesting to note is that the demon possessing Emily Rose moved around with Emily Rose causing more physicality and extreme conditions surrounding her whereas, Regan (when possessed) was confined to her bedroom while the adults around her moved in and out of the bedroom. Also, the possession of Regan and Emily are representative of Chris and Erin’s choice at limiting the morality of religion in today’s apathetic and conflicted compliance to have faith. What’s also intriguing is the use of special effects in the portrayal of demon possession in these young women. With ‘The Exorcist’, Regan is dressed in makeup and hooked to prosthetic pieces to convince audiences of a very toned and realist portrayal of possession. Regan’s increasing make-up made the progression of her possession more evident and having a thin tube attached to the inside of her mouth to allow a practical oozing of vomit (infamous pea-green soup) coming from her mouth; a queasy scene where Regan is put through a carotid angiography and the recently re-inserted spider-walk scene (for the Director’s cut on DVD). These effects are all practically performed with prosthetics, harnesses and make-up and therefore have some differing ambitions than the digital effects in ‘The Exorcism of Emily Rose’. One of the most notable sequences includes Emily walking outside in the middle of the night, after being startled by the increasing presence of her demon possessors, envisioning the people around her with demonic faces that quickly resemble decayed versions of Edvard Munch’s “The Scream” and the dilation of Emily’s pupils to symbolize her possession. Again, the ambitions do increase with digital effects, but ‘Emily Rose’ does keep most of the physicality and effects practical by use of various equipment. Both films utilize these special effects to symbolize the struggle that plagues the exorcizing of demons from these young girls and to unnerve the viewers with a realistic portrayal of the exhaustive nature that the process takes. Intriguingly enough, the lasting effects that both films have on audiences wildly differ mainly due to the amount of time that the films have been able to have concerning “shock value” and questions about “science and faith”. Having the biggest box-office cume as an R-rated film, ‘The Exorcist’ has cemented itself in pop-culture by its audacious ability (in the 70s) to terrify and intrigue audiences by it’s vulgarity, as well as its questioning what faith and science can offer individuals. The biggest statement that ‘The Exorcist’ makes is whether psychology has replaced religion due to the decreasing influence of the church and the rising need of empirical evidence and a philosophical skepticism. ‘The Exorcism of Emily Rose’ deters the trend set in ‘The Exorcist’ when the debate between science and faith becomes the focus when Father Moore on trial for the murder of Emily Rose. Although having a very decent box-office cume, it represented the last “possession” film to remarkably and creatively re-invent the genre as there hasn’t been a film since then to create lasting impressions. Both ‘The Exorcist’ and ‘The Exorcism of Emily Rose’ propagate differences and similarities that clearly attribute their importance and relevancy back in the 70s and 2000s when spirituality became highly dependent as a consequence for our acceptance or rejection in science; when our participative and passive interaction with the concept of possession as possible truth; when the special effects are highly dependent on budgetary allowance and purpose for the film to portray a gritty, yet realistic display or a slick and clean demonstration is an escape viewers wish to accept; when its portrayal of violence as pain is to symbolize where faith is concerned or shocking as to unnerve audiences; when that profitability at the box-office becomes primary evidence by its inferred statement that audiences are affected spiritually, physically or psychologically and finally when its reception and interpretation that’s founded on realism that psychology replaces religion or the idea that religion and psychology can co-exist; when all is to indicate that its perception is dependent on the openness of the reader. What an electionCanadahad on May 2nd, 2011. We saw two political parties crumble before our very eyes; the re-instatement of our Conservative government with a majority and the decimation of the, often referred as “sovereign political party” in the Bloc Quebecois”. 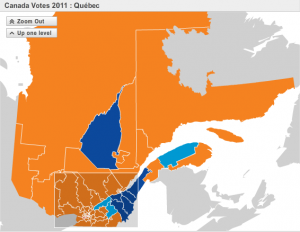 Based on the 2011 Federal Elections of Canada, the majority of Québec voters have rejected ideals of sovereignty by the Bloc Quebecois in favor of more cohesive participation in federal politics. What is also being called a “political earthquake” by many all acrossCanadais the sweeping power of the NDP (New Democratic Party) almost entirely replacing the Bloc Quebecois and what is being held as the “death of the Sovereign movement in Québec”. These changes are nationally important to see in detail because; these political shifts state the intentions of the voting public. One can understand the perspective of political leaders in Québec having a sovereign stance to gain the independence of their land but, Canadians (those in Montreal and outside of Québec) aren’t out to get the French population. We’re seeking an integration of bilingual laws, in the province of Quebec, because its beneficial to everyone. Once you start limiting accessibility to language, one tends to alienate those around you. For example, many tourists avoid Quebec because of its French language laws forcing signage to be in French. Having a bilingual stance (both French and English) would open up tourism to countries that’re predominantly English-speaking. A culprit of this problem stems from Bill 101, where publicly funded institutions should be oriented around (and only towards) the French language. This law would be a bastardization of culture in Montreal (and most likely those in Quebec) that limits exposure from the USA, who’s our most prominent economic and culture partners. What’s also important, is that parents wish their children can learn both French and English because, the more accessible a language is can only benefit their exposure to travel, live and work in foreign countries. What Bill 101 does, is limit the population to French based countries and strains ties with English-dominant speaking countries. This is not an ideal many want represented in politics. Many voters have made it prominent that they no longer see the subject of sovereignty serves them purpose on the federal level of politics. This was seen by Quebec’s voting public making drastic changes by reducing the Bloc Quebecois’ seats to just a handful (from a prominent 40 plus seats). This decision to vote for the NDP (now Canada’s official opposition party) instead of the Bloc sends the message that those ideals of an independent Quebec are long behind us. The consequences of this act have been numerous and, as some may argue, beneficial. Based on federal election results, there’s major debate on whether the Bloc Quebecois can be stripped of its status as an official political party at the federal level. There (possibly) endeth the sovereignist ideals of Québec on the national level of politics in Canada. Giles Duceppe, the leader of the Bloc Quebecois, has been reduced to a punch line at this year’s federal elections. His stances have long been repetitive and re-used at many of the recent past federal elections showcasing no new progress or changes. An ideology growing stagnant and losing momentum, the party was often regarded to provide interesting sound-bites and nothing else. 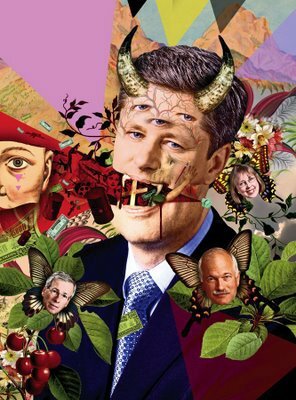 During the leaders’ debate, Duceppe stated many idioms that trended on Twitter and published in newspapers, they all but reduced his intentions as laughable and degrading as the public representative of his party’s sovereign ideals. 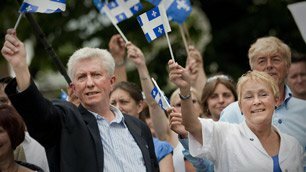 Duceppe even quit his job as leader of the Bloc Quebecois during his cessation speech as the federal elections came to a close because, the vision they wanted as no longer what the people of Québec wanted. This vision would render Québec’s involvement with federal politics inconsequential and would make demands no Prime Minister would ever grant. I thought to throw in a shot while I still can. Instead, we voted for the NDP in hope that they would bring our ideals to Parliament and represent our current ideals of preserving our unique culture in Québec; provide increase in jobs; stabilize our economy and keep providing public funding towards our public institutions in schools, hospitals and public spaces. Sweeping our (hopeful) message of change, the NDP represented the change we think is necessary. It quickly alarmed and alerted our federal government, now a conservative majority, that we want change and that we’ll be expecting it, that sovereign ideals are no longer a topic of discussion and no longer our political crutch. What’s my message? Is it that we need to rid ourselves of the Bloc Quebecois and their sovereign ideals? Well, yes and no. It’s great that we don’t wish to be muddled by the rest of Canada’s vision of culture and legislation because; we wish to protect our values and political importance. In Quebec, Montreal has a great French and English culture, of festivities and camaraderie that seems to make everyone living here content. It seems that Montreal and Quebec don’t want to co-exist but, we’re here to work together in wanting to keep our culture and our identity. Quebec has all but unanimously said to the Bloc Quebecois (and indirectly to the Parti Quebecois on the provincial level) to stop with the “Soveriegnty” and begin with a vision of Quebec politics working as part of Canada’s Parliament. I’m just getting familiar with with my new blog here. Bare with me while I figure out the kinks and get myself oriented. Just wanted to write here to you on any number of things that encompasses movies, television, entertainment, music, politics and everything in between. Another thing I will hopefully get to: finding a focus for this blog. I hope you’ll enjoy reading these as much as I enjoy writing them.